November 25, 2015, 2:44 PM · In an effort to promote the coverage of live violin performance, Violinist.com each week presents links to reviews of notable concerts and recitals around the world. Hilary Hahn performed the Dvorak with the Baltimore Symphony. Baltimore Sun: "In addition to her usual, impeccable intonation and articulation, the violinist offered phrasing rich in shading and poetic contour. Her tone was wonderfully juicy in the first movement, sweet and delicate in the second; the finale inspired a prismatic touch. I was even more impressed with Hahn's encore -- the Loure from Bach's Partita No. 3. She seemed to hold the packed house rapt as she sculpted the stately dance in extraordinarily elegant fashion." The Washington Post: "Hahn remains one of the greatest violinists in the world. The musical architecture is worked out to the millimeter; the flawless brilliance of her top register dazzles the ear; the rock-steady control of rhythm and accents makes everything seem natural and inevitable, and the cleanliness of her bow arm puts a little sparkle on each note. All of this was fully present in the Dvorak, but there were tiny slips here and there that were uncharacteristic." Isabelle Faust performed the Berg with the Boston Symphony Orchestra. Boston Musical Intelligencer: "...she didn’t put on the flashy, oversized tone of many a violin superstar, but chose a measured tone with a steely core that cut through BSO brass outbursts that have swamped over many a lesser musician. She had technique to burn, making Berg’s fiendishly difficult leaps, rhythmic variation, and frequent triple stopping sound fluid and effortless." Boston Globe: "...the performance of the Berg did not speak with the full lapel-grabbing force this music is capable of mustering. But the evening’s fine soloist, Isabelle Faust, delivered an account whose hushed reveries and cool colors had a beauty all their own." Jennifer Koh performed the Nielsen with the Buffalo Philharmonic Orchestra. The Buffalo News: "There are meltingly lovely melodies and Koh, stunning in a long gown of gunmetal blue, played them with warmth and imagination. Her intonation is wonderful. She can repeat a simple phrase and give it a different mood the second time around. As she navigates quick passages, her head bobs and her hair flies. She even broke strings. Good theater!" Renaud Capuçon performed Bruch’s Violin Concerto No. 1 with the Cincinnati Symphony. Cincinnati Enquirer: "Capuçon delivered a breathtaking performance of Bruch’s Violin Concerto in G Minor. He played with a big, romantic sound and beautiful line from the outset. The violinist poured intensity into each phrase, often turning to communicate with the orchestra, as if playing chamber music." Jonathan Carney performed and conducted the Brahms with the Pennsylvania Sinfonia Orchestra. The Morning Call: "One could tell things were going to sound special from the very first movement, as Carney skillfully built up the slow, curvaceous opening gesture into a full-bodied crescendo. Although the pure, compact sound of Carney’s violin could make itself heard when it wanted to, a few phrases got buried by the church’s not-so-ideal acoustics. Nevertheless there was plenty of detail to be heard, and the extended cadenza was masterful, chock full of finely shaped trills and virtuosic embellishment." Elena Urioste performed the Sibelius with the Tucson Symphony Orchestra. Green Valley News: "Her reading of the Sibelius 'Violin Concerto' was incredibly virtuosic in the allegro first movement, and sonorously heartfelt in the Adagio, where the soul of the piece lies." Leonidas Kavakos performed the Sibelius with the Philadelphia Orchestra. Philadelphia Inquirer: "It was terrific to hear Leonidas Kavakos in the Sibelius Violin Concerto - it is, in fact, terrific to hear him in anything. That immediately present tone that toggles so easily between secure whispering and secure meatiness was all there. Interpretively, he sometimes failed to go deep, especially in the first movement, whose layers of meaning offer tremendous riches to risk-takers." Karen Gomyo performed Philip Glass' Violin Concerto No. 1 with the Dallas Symphony. D Magazine: "Gomyo is well-suited for this piece. She plays it with a perfect combination of agility and delicacy. She’s also a great collaborator, blending beautifully with the ensemble and never forcing solo sections into unnecessary showcases of virtuosity." The Dallas Morning News: "Karen Gomyo was as compelling a soloist as could be imagined, dispatching the busy figurations with pizzazz, pinpointing high pitches with laser accuracy." November 25, 2015 at 11:09 PM · still not sure about the relevance of discussing Ms Ko's gunmetal dress, especially at that point in the sentence where it was stashed. Maybe im just in a bad mood. November 26, 2015 at 01:17 AM · I guess appearance is part of any live performance, but it can be a little awkward in a review! November 26, 2015 at 01:28 AM · HH is truly a fabulous violinist. I do wonder if her violin is at risk of being scratched by her penchant for dangly bangly earrings. 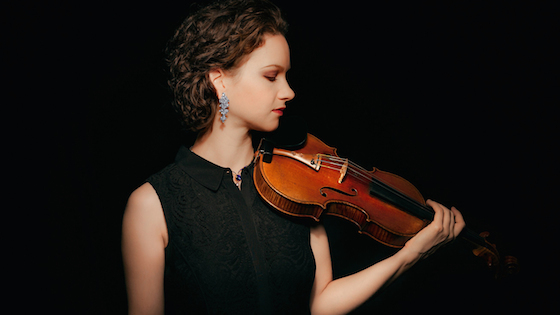 November 26, 2015 at 08:04 AM · Hilary Hahn is astounding. I mean who debuts with a recording of the Bach solo S&P's at age 18 to critical acclaim?! I prefer all her concerto recordings above anyone else's. November 26, 2015 at 11:50 AM · There's a recording of Ms Hahn playing the Dvorak on Youtube. If she played it as well as that then the audience had a real treat - even with a few incidental slips(!). I love critic-speak. Can anyone explain what is a 'prismatic touch'? And a gem from a previous blog - 'evocative changeability'. Maybe these are Americanisms which poor Brits like me don't understand. Perhaps if I'd been able to introduce these into my playing I would have progressed further? I too love her playing. I have more of her CD's than any other contemporary violinist. a 'prismatic touch' is where someone gropes ypu on the tube and automatically gets sent down. Hence, 'prismatic. 'Quite right too. Bloody dodgy if you ask me. November 26, 2015 at 09:43 PM · I was at HH's performance of the Dvorak with the BSO at the Meyerhoff in Baltimore. (She performed at the Strathmore on Thursday, which was the WaPo review, and then at the Meyerhoff on Friday and Saturday, and the Sun review doesn't make clear which of the latter two performances was reviewed). I was in the fourth row, somewhat left of center, and thought that she could have had a little more punch (I don't know how well her sound carried to the back of the hall), but she was audible at all times. November 27, 2015 at 02:47 AM · I think the fourth row is too close, although a great opportunity to watch details. I had first-row seats right in the center for cellist David Finkiel and it was like looking directly up the fingerboard and into his nose because his end pin brings the lower bout of his cello up higher (not as high as Rostropovich). We were able to move a little at intermission and the sound improved because the ensemble with the piano came into better focus. I also do not care for the pretentious neologisms of the critics. But, after writing the same droll things for years at a time, I guess one needs to spice things up once in a while. What is one going to say about HH? That her tone was good? That she played in tune? Sheesh. And yes it's impressive that HH made a recording of Bach as a teenager, but let's not forget ASM recorded two Mozart concertos with Karajan at 15. You could argue that the whole of the Bach S&P was a stiffer challenge, and I would have to agree with that, but both were brilliant accomplishments by two frightfully good violinists. November 28, 2015 at 10:51 PM · Maybe the Globe is catching-on to Isabelle -- beautifully nuanced playing, in a post-modern sort of way . . .